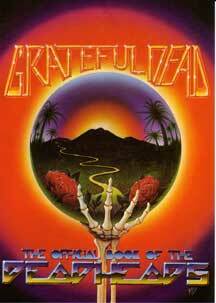 What has transpired since then we have tried to share with you through our Newsletters, Almanacs, and the Official Book of the Dead Heads, which has a wide assortment of letters, art, and photos up until 1983. Over the years, I have kept everything you have sent in close to heart and in safe keeping. I now hope to open these files again and share more of the creations given to us by you, the Dead Heads. The Dead Head list is still going strong, with more new names added each day. As always, "Thank you and stay in touch."